Not many people at pet stores know what they are talking about... only a rare few are actually knowledgeable. sooo true. I even had one time where there were a few family's in the shop and i was telling info to one group and than after i was done they were walking around, and i over heard another family softly tell the family i talked to "dont lisen to her pet shop ppl dont know nothing about the care of a pet they just tell you so they can make a sale"
I did not say nothing but it did make me mad.... even tho i do know alot of pet shop ppl dont know what there talking about <_<.. its just so crazy now of days. Im vegetarian, so maybe I think its sadder than most people would LOL. I am vegetarian too,but have nothing against meat or people who wanna eat it.Also not against feeding reptiles.Thats just MY opinion though. 98% of all animal crultey intendional or not is caused by misimformation and human stupitity. Wow, a leucistic for $70?! Thats a bargin, LOL! IMO its better if people raise their own live food, sine that way you know how it was treated and where it came from. I know Dubia roaches are pretty popular too, but the wings creep me out. Anyway, Im glad you know your stuff when it comes to reptiles. There are SO many stupid people out there that dont know anything, and the animals suffer... Like your poor little citrus baby! Hes super cute, BTW. I could look at beardies all day LOL. Im on vacation right now, and I miss my little guy! yep sure do i breed my hissers for my dragons and i use the baby hissers for the geckos some times. Also ya my leucistic was only 70 at the rep show. He was trying to sale them all that day. They were 200 but he had to put the price way down to get them all sold. I got him from Georgia Bearded Dragons. They were at the show. So, I know they have harder shells then some of the other roaches... Do your dragons still do OK with them? What size do you feed them? Do they breed fast enough for you? Sorry for hijacking your thread LOL! lol its fine we are still on topic i mean we are talking about feeding my reps lol. Ok well i feed mid size ones to my dragons. 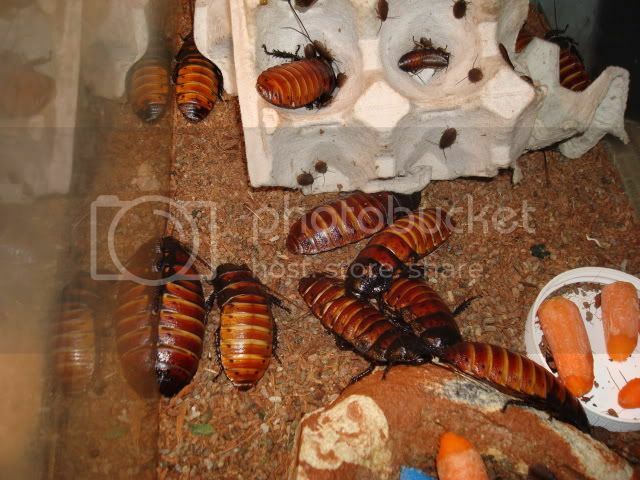 If i get to many roaches i let some grow up to adults than sale them. I sold 5 pairs the other week. Now i got a ok number lol. If get to many again i let them grow and sale some of the adults again. I guess its how i make money back on them lol. do u feed them zebra finches too? no, i breed and sale my zebra finches. I got a white male and a gray female and they breed very good. They make nice babies. I let them have a few clutches than i close the box and let them rest than i reopen it and let them do it again and they do good. I always give them a rest so they dont over breed. 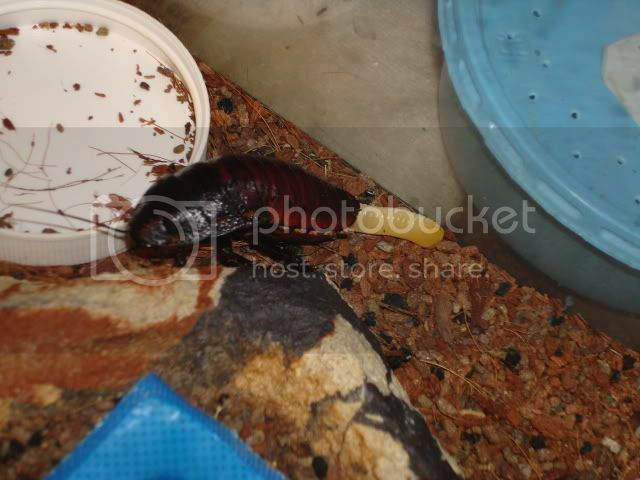 also yes them roaches breed good and fast. I started with one pair 2 years ago. Now i got lots. Just keep the tank temp around 80F-82F and they should do there job. Last edited by DragunzGirl; 03-24-2010 at 10:43 AM. I always wanted pet roaches...but after dealing with stinky crickets,I am not sure I want roaches.I assume they smell too? At least in large numbers? It is not enforced,same with giant millipedes.Your not supposed to have them here,but people do and I did.And I will have another when/if I find one. There is a place here in Newfoundland with roaches,millipedes,centipedes,scorpions...etc,etc, etc.The name escapes me now...gaaahhh,thats going to drive me nuts. Found it! It is called: Newfoundland Insectarium. Was driving me nuts and so I looked it up! Last edited by VanillaRat; 03-24-2010 at 03:02 PM. True, as many people still have them. Its probably easy to obtain,breed,sell and keep them in smaller areas then it is in cities. Aswell I don't think the officals really do anything other than confiscate the animals (or bugs). Last edited by canadiancritter; 03-24-2010 at 05:04 PM.